WASHINGTON, D.C. , Apr. 18 /CSRwire/ - Sol Systems joined Washington, D.C. Mayor Muriel Bowser to celebrate the completion of a 11.8 MW solar system for Washington D.C.’s Department of General Services (DC DGS). The portfolio of onsite solar projects is now in operation across 40 properties and includes schools, hospitals, and the Police Training Academy, making it one of the largest and most complex onsite municipal solar projects currently operating in the country. Sol Systems oversaw the PPA negotiation and structuring, as well as all project logistics, schedules and contractors. 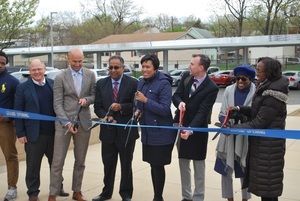 The timing of the ribbon cutting, which took place at HD Woodson High School – one of the largest solar systems in the District – was particularly momentous as Sol Systems also reached a new milestone of delivering over 700 MW since inception this week. Despite the scale and complexity of these projects, all 35 were successfully designed, engineered, and generating electricity for the city in approximately 18 months. DGS estimates the projects created 140 temporary jobs during construction and design, as well as a projected five permanent jobs for ongoing operation and maintenance. Over the 20-year term of the power purchase agreement, D.C. taxpayers are expected to save $25 million in reduced electricity costs. The projects are expected to generate 13,800 MWh of electricity per year, which will reduce greenhouse gas emissions equivalent to over 10 million pounds of coal burned. Check out our case study on the portfolio, which includes all the crunchy details, from DOE’s Better Buildings website.